Now, I think I've finally made the perfect Kanten Jelly that I wanted! I laid soft wax paper inside a small cup, and tied top of the paper after I poured Kanten liquid and placed a strawberry in the center. It was a small bite size, so it finished molding in the fridge within 3o min. Doesn't it look nice? .It still isn't as clear as I wanted it to be, but it turned out OK, for Kanten Jelly. My husband describes this as " Strawberry Crystals"
I used 1 Cup of water per 1 package's Kanten Powder (2 grams), and I could make almost 10 little pieces (little smaller than ping pong boll) of this little Kanten jelly with small strawberry in it. 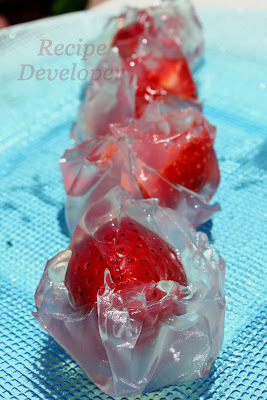 Kanten jelly does not melted soon in a room temperature like gelatin jelly, so it's very easy to handle and make it. Like this shinny little dessert, I hope to see more summer like sunshine in here too!